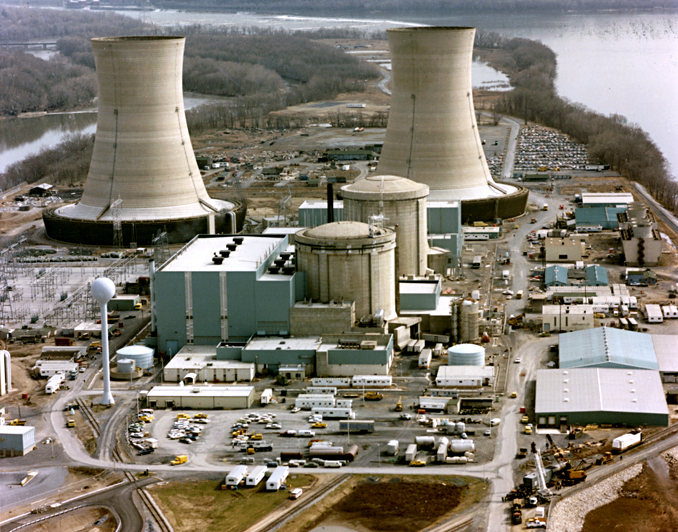 The accident at the Three Mile Island Unit 2 (TMI-2) nuclear power plant near Middletown, Pennsylvania, on March 28, 1979, was the most serious in U.S. commercial nuclear power plant operating history, even though it led to no deaths or injuries to plant workers or members of the nearby community. But it brought about sweeping changes involving emergency response planning, reactor operator training, human factors engineering, radiation protection, and many other areas of nuclear power plant operations. It also caused the U.S. Nuclear Regulatory Commission to tighten and heighten its regulatory oversight. Resultant changes in the nuclear power industry and at the NRC had the effect of enhancing safety. 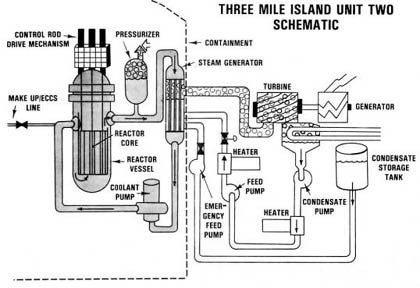 The sequence of certain events - - equipment malfunctions, design related problems and worker errors - - led to significant damage to the TMI-2 reactor core but only very small off-site releases of radioactivity. The accident began about 4:00 a.m. on March 28, 1979, when the plant experienced a failure in the secondary, non-nuclear section of the plant. The main feedwater pumps stopped running, caused by either a mechanical or electrical failure, which prevented the steam generators from removing heat. First the turbine, then the reactor automatically shut down. Immediately, the pressure in the primary system (the nuclear portion of the plant) began to increase. In order to prevent that pressure from becoming excessive, the pressurizer relief valve (a valve located at the top of the pressurizer) opened. The valve should have closed when the pressure decreased by a certain amount, but it did not. Signals available to the operator failed to show that the valve was still open. As a result, the stuck-open valve caused the pressure to continue to decrease in the system. Meanwhile, another problem appeared elsewhere in the plant. The emergency feedwater system (backup to main feedwater) was tested 42 hours prior to the accident. As part of the test, a valve is closed and then reopened at the end of the test. But this time, through either an administrative or human error, the valve was not reopened - - preventing the emergency feedwater system from functioning. The valve was discovered closed about eight minutes into the accident. Once it was reopened, the emergency feedwater system began to work correctly, allowing cooling water to flow into the steam generators. As the system pressure in the primary system continued to decrease, voids (areas where no water is present) began to form in portions of the system other than the pressurizer. Because of these voids, the water in the system was redistributed and the pressurizer became full of water. The level indicator, which tells the operator the amount of coolant capable of heat removal, incorrectly indicated the system was full of water. Thus, the operator stopped adding water. He was unaware that, because of the stuck valve, the indicator can, and in this instance did, provide false readings. Because adequate cooling was not available, the nuclear fuel overheated to the point where some of the zirconium cladding (the long metal tubes or jackets which hold the nuclear fuel pellets) reacted with the water and generated hydrogen. This hydrogen was released into the reactor containment building. By March 30, two days after the start of the chain of events, some hydrogen remained within the primary coolant system in the vessel surrounding the reactor, forming a "hydrogen bubble" above the reactor core. The concern was that if reactor pressure decreased, the hydrogen bubble would expand and thus interfere with the flow of cooling water through the core. Over the next few days, the bubble was reduced by "degassing" the pressurizer -- adjusting air and water pressure. Without water to cool it, and with the top of the reactor core uncovered, the primary damage to the reactor occurred two to three hours into the accident. Although no "meltdown" occurred in the classic sense of the word, in that fuel did not "melt" through the floor beneath the containment or through the steel reactor vessel, a significant amount of fuel did in fact melt. Radioactivity in the reactor coolant increased dramatically, and there were small leaks in the reactor coolant system which caused high radiation levels in other parts of the plant and small releases into the environment. Shortly after the accident began, some of the water, carrying fuel debris and fission products, escaped from the reactor coolant system and flowed into the reactor building basement. By the time the accident had ended, the water in the basement had been heated by residual heat from the reactor vessel, evaporated, condensed on the walls, and drained down onto the floors and back into the basement. The radionuclides then permeated into the porous surfaces of concrete and layers of iron which later became corroded (this area of the plant became a major focus of the subsequent clean-up and decontamination). Response to the accident was swift. The NRC's regional office in King of Prussia, Pennsylvania, was notified at 7:45 a.m. on March 28. By 8:00, the NRC headquarters in Washington, D.C. was alerted and the NRC Operations Center in Bethesda, Maryland, was activated. The regional office promptly dispatched the first team of inspectors to the site and other agencies, such as the Department of Energy, and the Environmental Protection Agency, also mobilized their response teams. Helicopters hired by TMI's owner, General Public Utilities Nuclear, and the Department of Energy were sampling radioactivity in the atmosphere above the plant by midday. A team from the Brookhaven National Laboratory was also sent to assist in radiation monitoring. At 9:15 a.m., the White House was notified and at 11:00 a.m., all non-essential personnel were ordered off the plant's premises. From the early stages of the accident, low levels of radioactive gas, mostly in the form of xenon, continued to be released to the environment. At the time, efforts to halt the releases were unsuccessful and there was some fear of an explosion from the buildup of hydrogen - -fortunately, this did not occur. 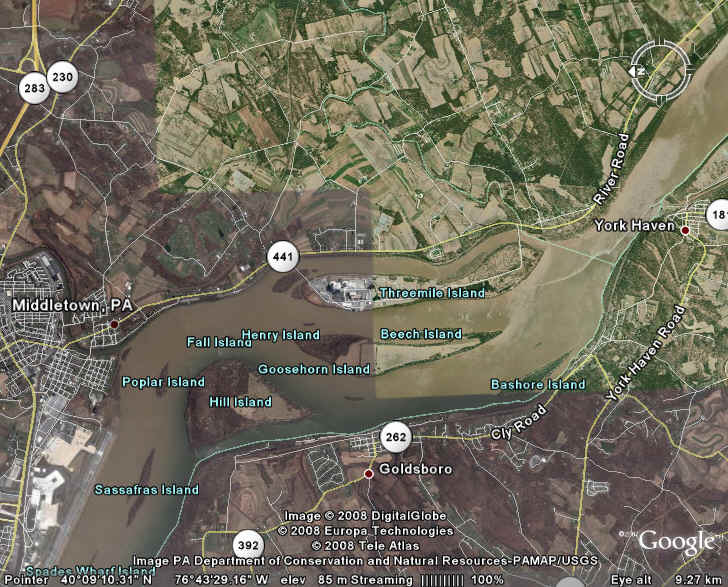 However, on Friday, March 30, Governor Thornburgh of Pennsylvania ordered a precautionary evacuation of preschool children and pregnant women from within the 5-mile zone nearest the plant, and suggested that people living within 10 miles of the plant stay inside and keep their windows closed. Most evacuees had returned to their homes by April 4 -- by that time, the situation at the reactor had been brought under control. The American Nuclear Insurers, an organization made up of nuclear insurance firms, had already begun distributing checks to evacuees to cover hotel and meal expenses, and was beginning to handle claims for property and liability losses. Detailed studies of the radiological consequences of the accident have been conducted by the NRC, the Environmental Protection Agency, the Department of Health, Education and Welfare (now Health and Human Services) , the Department of Energy, and the State of Pennsylvania. Several independent studies have also been conducted. Estimates are that the average dose to about 2 million people in the area was about only about 1 millirem. To put this into context, exposure from a full set of chest x-rays is about 6 millirem. Compared to the natural radioactive background dose of about 100-125 millirem per year for the area, the collective dose to the community from the accident was very small. The maximum dose to a person at the site boundary would have been less than 100 millirem. In the months following the accident, although questions were raised about possible adverse effects from radiation on human, animal, and plant life in the TMI area, none could be directly correlated to the accident. Thousands of environmental samples of air, water, milk, vegetation, soil, and foodstuffs were collected by various groups monitoring the area. Very low levels of radionuclides could be attributed to releases from the accident. However, comprehensive investigations and assessments by several well-respected organizations have concluded that in spite of serious damage to the reactor, most of the radiation was contained and that the actual release had negligible effects on the physical health of individuals or the environment. Today, the TMI-2 reactor is permanently shut down and defueled, with the reactor coolant system decontaminated, the radioactive liquids treated, most components shipped to a licensed low-level waste disposal site, with the remainder of the site being monitored. The owner, General Public Utilities Nuclear Corporation, says it will keep the facility in long-term storage until the operating license for the TMI-1 plant expires in 2014, at which time both plants will be decommissioned. The causes of the accident continue to be debated to this day. However, based on a series of investigations, the main factors appear to have been a combination of personnel error, design deficiencies, and component failures. There is no doubt that the accident at Three Mile Island permanently changed both the nuclear industry and the NRC. Public fear and distrust increased, NRC's regulations and oversight became broader and more robust, and management of the plants was scrutinized more carefully. The problems identified from careful analysis of the events during those days have led to permanent and sweeping changes in how NRC regulates its licensees - - which, in turn, has strengthened public health and safety. Expansion of NRC's international activities to share enhanced knowledge of nuclear safety with other countries in a number of important technical areas. 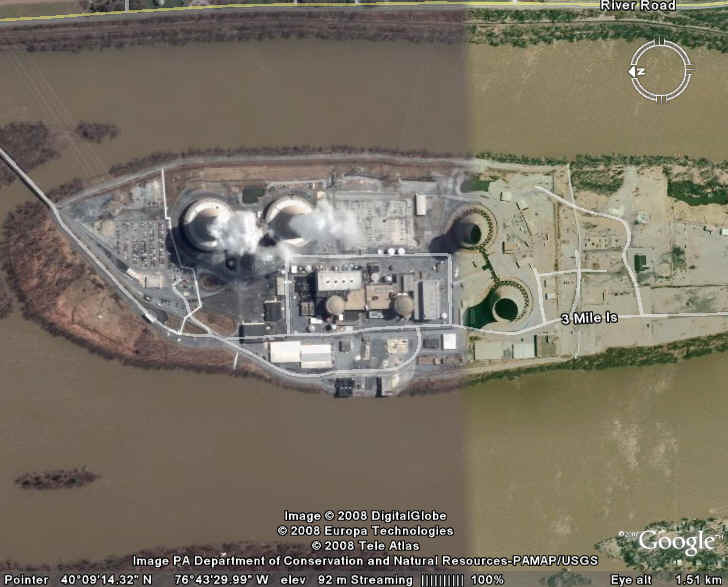 The accident at the Three Mile Island Unit 2 (TMI‑2) nuclear power plant near Middletown, Pa., on March 28, 1979, was the most serious in U.S. commercial nuclear power plant operating history, even though it led to no deaths or injuries to plant workers or members of the nearby community. But it brought about sweeping changes involving emergency response planning, reactor operator training, human factors engineering, radiation protection, and many other areas of nuclear power plant operations. It also caused the U.S. Nuclear Regulatory Commission to tighten and heighten its regulatory oversight. Resultant changes in the nuclear power industry and at the NRC had the effect of enhancing safety. The sequence of certain events – equipment malfunctions, design-related problems and worker errors – led to a partial meltdown of the TMI‑2 reactor core but only very small off‑site releases of radioactivity. The accident caught federal and state authorities off-guard. They were concerned about the small releases of radioactive gases that were measured off-site by the late morning of March 28 and even more concerned about the potential threat that the reactor posed to the surrounding population. They did not know that the core had melted, but they immediately took steps to try to gain control of the reactor and ensure adequate cooling to the core. The NRC=s regional office in King of Prussia, Pa., was notified at 7:45 a.m. on March 28. By 8:00, NRC Headquarters in Washington, D.C., was alerted and the NRC Operations Center in Bethesda, Md., was activated. The regional office promptly dispatched the first team of inspectors to the site and other agencies, such as the Department of Energy and the Environmental Protection Agency, also mobilized their response teams. Helicopters hired by TMI’s owner, General Public Utilities Nuclear, and the Department of Energy were sampling radioactivity in the atmosphere above the plant by midday. A team from the Brookhaven National Laboratory was also sent to assist in radiation monitoring. At 9:15 a.m., the White House was notified and at 11:00 a.m., all non‑essential personnel were ordered off the plant’s premises. By the evening of March 28, the core appeared to be adequately cooled and the reactor appeared to be stable. But new concerns arose by the morning of Friday, March 30. A significant release of radiation from the plant=s auxiliary building, performed to relieve pressure on the primary system and avoid curtailing the flow of coolant to the core, caused a great deal of confusion and consternation. 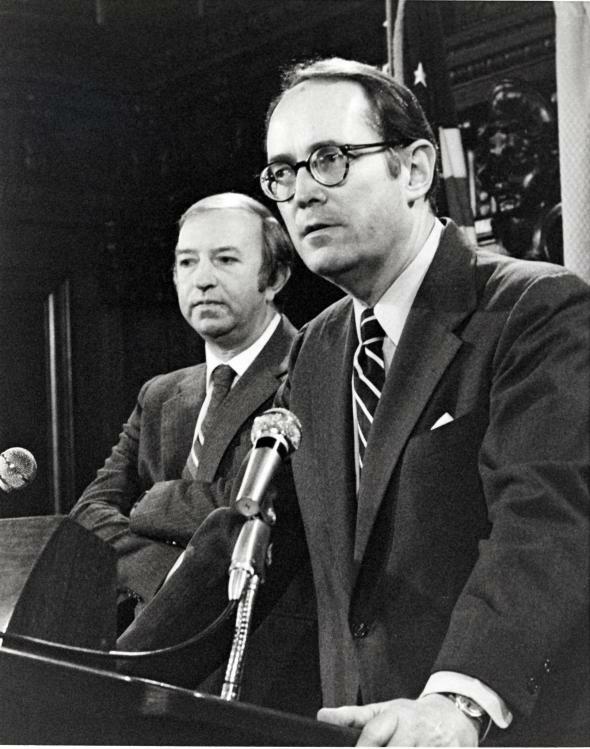 In an atmosphere of growing uncertainty about the condition of the plant, the governor of Pa., Richard L. Thornburgh, consulted with the NRC about evacuating the population near the plant. Eventually, he and NRC Chairman Joseph Hendrie agreed that it would be prudent for those members of society most vulnerable to radiation to evacuate the area. Thornburgh announced that he was advising pregnant women and pre-school-age children within a 5-mile radius of the plant to leave the area. 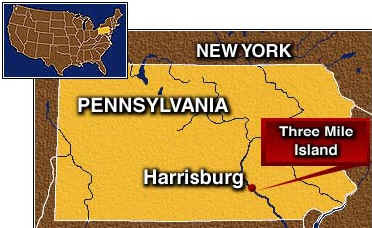 Detailed studies of the radiological consequences of the accident have been conducted by the NRC, the Environmental Protection Agency, the Department of Health, Education and Welfare (now Health and Human Services), the Department of Energy, and the State of Pa.. Several independent studies have also been conducted. Estimates are that the average dose to about 2 million people in the area was only about 1 millirem. To put this into context, exposure from a chest x‑ray is about 6 millirem. Compared to the natural radioactive background dose of about 100‑125 millirem per year for the area, the collective dose to the community from the accident was very small. The maximum dose to a person at the site boundary would have been less than 100 millirem. In the months following the accident, although questions were raised about possible adverse effects from radiation on human, animal, and plant life in the TMI area, none could be directly correlated to the accident. Thousands of environmental samples of air, water, milk, vegetation, soil, and foodstuffs were collected by various groups monitoring the area. Very low levels of radionuclides could be attributed to releases from the accident. However, comprehensive investigations and assessments by several well‑respected organizations have concluded that in spite of serious damage to the reactor, most of the radiation was contained and that the actual release had negligible effects on the physical health of individuals or the environment. The accident was caused by a combination of personnel error, design deficiencies, and component failures. There is no doubt that the accident at Three Mile Island permanently changed both the nuclear industry and the NRC. Public fear and distrust increased, NRC’s regulations and oversight became broader and more robust, and management of the plants was scrutinized more carefully. The problems identified from careful analysis of the events during those days have led to permanent and sweeping changes in how NRC regulates its licensees – which, in turn, has reduced the risk to public health and safety. Expansion of NRC’s international activities to share enhanced knowledge of nuclear safety with other countries in a number of important technical areas. Today, the TMI‑2 reactor is permanently shut down and defueled, with the reactor coolant system drained, the radioactive water decontaminated and evaporated, radioactive waste shipped off‑site to an appropriate disposal site, reactor fuel and core debris shipped off‑site to a Department of Energy facility, and the remainder of the site being monitored. In 2001, FirstEnergy acquired TMI-2 from GPU. FirstEnergy has contracted the monitoring of TMI-2 to Exelon, the current owner and operator of TMI-1. The companies plan to keep the TMI-2 facility in long‑term, monitored storage until the operating license for the TMI‑1 plant expires, at which time both plants will be decommissioned. Below is a chronology of highlights of the TMI‑2 cleanup from 1980 through 1993. July 1980 Approximately 43,000 curies of krypton were vented from the reactor building. Aug. 1993 The processing of 2.23 million gallons accident‑generated water was completed.